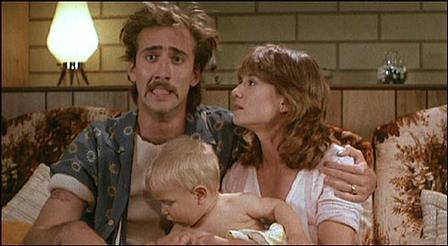 Nic Cage and Holly Hunter steal a baby in "Raising Arizona"
Having just watched Raising Arizona a couple weeks before I began this 100 Day marathon, I was kind of hoping I could find something to take its place. Robocop and Spaceballs were definite options but it was so last minute and Netflix didn’t offer those on stream, so I ended up watching Arizona. Now, I know that sounds like a let-down or somethng. Like, *sigh* “Guess I’ll watch it again.” but it really is a good movie. Some of the action is a bit over the top, but considering the plotline of the story, I suppose I could let it slide. Besides, I think I needed this movie to sort of lighten things up after yesterday’s Highlander screening and tomorrow’s Grave of the Fireflies. I’m kind of split on tomorrow. I’m looking forward to watching a Studio Ghibli movie but then at the same time, it’s going to bum me out so bad. I very rarely cry watching movies. I’ll get into that tomorrow though. Tags: 100 Years in 100 Days, Derrick Deane, movies, Raising Arizona. Bookmark the permalink. Within a couple of years of “Raising Arizona”‘s release, I lived in a house in downtown Baltimore with my best friends. We were all lovers of that movie. We had 2 VCR’s that had copies of “Raising Arizona” in them and the VCR’s were rigged so that when one tape finished, the other would automatically play. I’ve probably seen the movie 500 times. I’ve also met Holly Hunter and Frances MacDormand. Can you dig it?! Wow, I can dig that! That’s awesome! Kind of like me when Dumb and Dumber first came out.